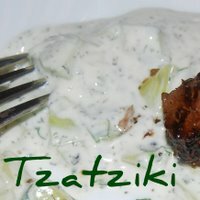 Tzatziki sauce from Greece, the best accompaniment for Souvlaki, the famous Greek grilled meat on skewers. you can use some pitta bread to sop up the juices. Based on yogurt and soured cream, we have changed the recipe around a little to make it even more healthy. Serve this great cooling sauce with any kind of grilled meat or fish. It also goes well with grilled vegetables and fruit. There's no cooking involved, so just follow the step-by-step instructions for a perfect result every time. 3 tbls. of extra virgen olive oil. 1 level tsp. of salt. 1/2 a cup - 4ozs./100g. of soured cream (we use zero fat creme fraiche for health reasons). 1 cucumber skinned and chopped. 1 handful of fresh dill chopped (we like to use the same amount of fresh coriander as well). Add the salt pepper and garlic and whisk again. Now add the yogurt and creme fraiche and whisk. Right - spoon in the cucumber and chopped herbs and stir until well combined. Cover and keep in the refrigerator until required.